A very popular design of compost maker, where, with a simple tumble, the contents are dropped from one end to the other, hitting the stainless steel breaker bar in the middle on the way. 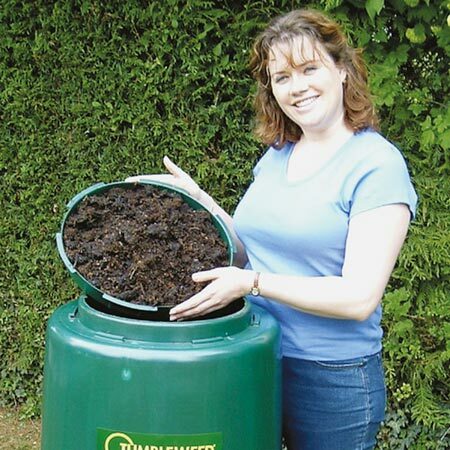 This means it gets well mixed and properly aerated, which means you get excellent quality compost in a short period of time! It's one of the strongest bins available, with a tough UV treated polypropylene body, robust galvanised steel frame and reinforced pivots. A ventilated lid at each end ensures the compost gets properly aerated without getting soggy, and it's easy to fill and to empty. Instructions provided for quick and easy home assembly. Assembed size: 65cm (26") wide x 85cm (34") deep x 117cm (46") high. 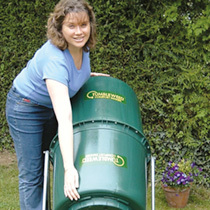 Capacity 220 litres. Gets well mixed and properly aerated!